When I woke up at 4:30 AM sans alarm clock on Saturday morning I finally realized that I was actually pretty anxious/nervous to toe the line at this years Mountain Madness 50K. MoMa has a reputation as being one of the tougher 50k’s in the Northeast, which is definitely represented in it’s 4h39m course record (held by Mike Dixon) which, for a low-altitude race is patently indicative of how tough of a course it is. Race reports, both published in blogs as well as orally dictated to me by myriad runners of varying abilities articulated only one thing for sure: rocks. Surprisingly, peoples impression of the course ranged from calling it near-impossible, to wheelchair accessible, so obviously some of the opinions I found were outliers to say the least.Considering this, it looked to me like I should be expectant of a rocky course with a substantial (6000′) amount of climbing. Rick McNulty provided the oral countdown leading precisely into 9AM (apparently he’s consistently punctual about start times) and we were soon rounding Shepherd Lake and heading into the woods. Within a mile or so (after hearing some runners in the chase pack yelling “too fast!” at us) the lead pack had reduced to a trio of Myself, Seth (who looks like Tarzan carrying a camelbak) and Bill Cuthbert. We headed up the initial climb at a staggeringly fast pace, and maintained what to me seemed like a relatively reckless clip through the first aid station (5.6 miles) wherein no one took any aid, and continued through several miles of the next leg until Seth and Bill gained ~200′ on me as Mike Dixon caught up, only for Bill and Seth to miss a turn (which Julian, who was taking pictures eventually reeled in and re-directed). Mike and I dialed things back to a more manageable pace heading into AS2 wondering if Bill and Seth would go too far off course, and taking some comfort in the lead that we had developed over the chase pack (at AS1 we were “reportedly” 5 mins ahead of Mike, and the chase-pack proper was supposedly several minutes behind him at this point). I refilled my bottle, downed a cup of Coke, and a couple of cups of water, snatched a few gels, and the two of us were out of AS2 reasonably quickly. I had been expecting to see Mike on the course, and since his reputation preceded him as a dominant runner at pretty much any race up to the 50-Mile distance (as well as a solid sub-24-hour showing at the WS100 in 2012) I was glad to be able to run with him most of the way into AS3 before I started to lose the pace, giving him about a minute lead going into AS3. Seeing Mike leaving as I came in, I tried my best to keep myself together, drink a bit, fill up my bottle, grab a couple of gels and give chase, but admittedly I was already starting to feel some stomach issues rising, primarily what seemed like an insatiable thirst, and a surprising reluctance to continue forcing down gels. The route from AS3-AS4 was an out-and back consisting primarily of fire roads with a stretch of single-track in between. Roughly 1/3 of the way to AS4, Seth caught up to me, and the two of us took full advantage of the downhill, basically running recklessly into AS4, while I was mentally coming to grips with the fact that this 3-ish mile downhill was going to turn into a 3-ish mile uphill before I knew it, and a low point was definitely coming up. Seth came into AS4 and left without taking anything, roughly 30 second ahead of me, not feeling so great, and already noticing some of the early onsets of dehydration (dark urine, constant thirst) I took a few moments to collect myself, grabbed a fresh bottle from Dena (who was slinging bottles for the day) socked back a few cups of water, and started my way back up the hill. The nice side of the Out-and-Back is that you can see any competition/friends, as well as how they’re doing. As I was leaving, Bill was charging into the aid station, followed by Jason, Lindsay, and David Allara, all of whom have had some rather successful races in the recent past, and from what I knew going into the race, Dixon, Hamoudi, and Allara should be the Raritan Valley triumvirate to look out for. I also had the pleasure of running into the Parakeet, as well as Robbie and Adam from the Salt crew on this stretch, and their encouragement was more than welcome to say the very least. In spite of the obvious proximity of formidable competition, my own waxing misery was starting to get the best of me, especially with respect to the seemingly interminable climb (which, for the record was a blast to go down) so as I was getting close to AS5, Bill eeked by me a few hundred yards before the aid station. Coming into AS5, I could see Dixon and Seth heading out, and Bill refueling unbelievably quickly and hustling after them. Feeling dejected and dehydrated, I had my bottle refilled by a kindly volunteer, drank a few cups of water, and rudely informed (upon being asked) another volunteer that you could get a buff with a visor from the internet (the same place you can buy anything) before I headed back out on the trail to try and hunt my way back into podium position. 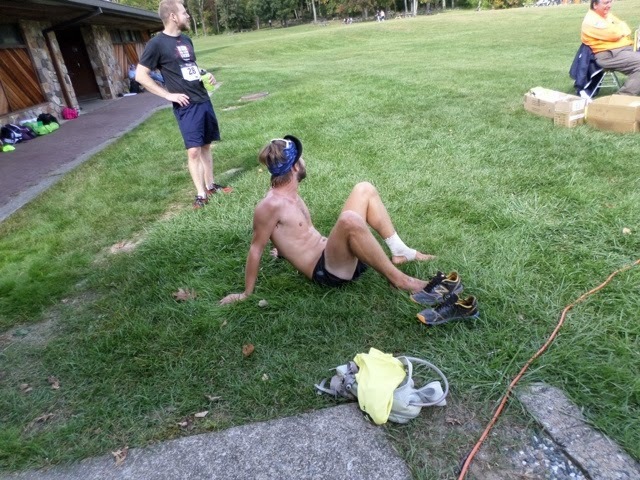 Feeling fundamentally miserable, I recognized that it’s precisely this point in any given race wherein you can really test your gumption, and after mulling over the idea of DNF-ing at the next aid station, I began to slowly, but surely start grinding my way back into the game. Fortunately, this section was (at the start) pretty steep and technical, so power-hiking no longer felt like I was surrendering to fatigue, but rather a smart game plan. I began to regain some strength and energy, finally reeling Bill back in on one of the extended declines. Little to my surprise however, on the next incline Bill quickly went out of sight (and apparently soon after took a wrong turn). Before long, I could see Shepherd Lake again, and started to pick things up headed into the aid station. Upon retrieving my bottle, slugging back a cup or 2 of water, and ditching my singlet, I was informed that I was in 3rd place, with the leaders only 5 mins ahead of me (it turns out that this was a grossly wrong estimate of the amount of a lead that Mike had on me), so elated,I left the aid station at full-steam(and letting out a primal scream). As I was leaving, I saw Lindsay coming in, figuring that I had ~90 seconds on him, and that if I really went hard I just might catch up to the leaders, I was acutely aware that I was both hunting, and being hunted. With every squirrel that moved, or breeze that blew a tree, I was convinced that someone was catching me on the final seven mile loop headed into the finish, running scared is a wonderfully exciting, as well as stressful endeavor. In the final 7 miles there were several sections that utilized switchbacks, with my fear of being caught up to, I found myself incessantly looking back on every turn whilst trying to keep a low profile, foolishly hopeful that this might make me harder to see (it doesn’t). 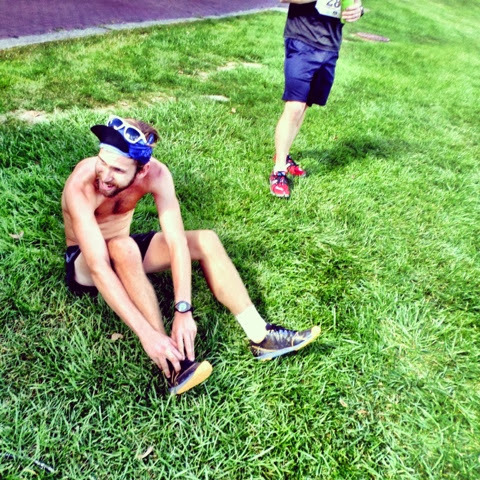 After just over an hour of running like my life depended on it, I came across the finish line to find myself in 2nd place, 5:15:15 elapsed, and laid down next to the finish line to take off my shoes and soak in some sun. Bill came in 2 minutes later (5:17:16) Seth DNF’d, Lindsay came in 4th (5:24:36). Jason finished 9th in 5:45:15, Adam 20th (6:32:49) Robbie 30th (6:45:06) and the Parakeet DNF’d after reportedly taking no water for the first 6 hours. A special thanks goes out to the following: Jeff Perry, for his incredible advice with regards to tapering, and race planning, Dena Orkin, for tossing bottles all day, and Jayson Kolb, for the race description, and the Saturday long run guys for their companionship the past few weekends out.